What to Do On Your First Day in Paris? Use Our Day 1 Plan! What should you plan to do on your first day in Paris? Let's say your visit officially starts around 8am when you walk through the jet bridge from your plane into Charles de Gaulle Airport after an all-night transatlantic flight and little sleep. Despite feeling tired and jet lagged, you're excited to be arriving early in the City of Light and you want to make the most of your day. Retrieving your checked baggage, showing your travel documents at French Border Control, passing through Customs, and getting from the airport to your Paris hotel to drop off your bags will take a couple of hours, and you'll probably need to head back to your hotel around 2pm to check in - but aside from that, the rest of day is yours to enjoy. We recommend keeping your first day in Paris flexible but active in order to get on a normal schedule as quickly as possible. Perhaps take a hot shower when you check into your hotel, but resist the temptation to take a nap - or, if you feel as though you'll collapse without one, set your alarm to sleep no more than one hour. To make your first day memorable, plan a few easy and interesting activities to orient yourself to the city, especially if this is your first trip to Paris, while also seeing a few iconic sights. Of course, not everyone arrives early in the morning, so we've organized our Day 1 Itinerary based on time of day. You can easily customize this plan based your own arrival time, interests, and energy level. We also give you details about specific walking routes, activities, and tours, as well as recommendations about what NOT to do on your first day in Paris. Have a wonderful First Day in Paris! For planning purposes, let's say your first day in Paris starts as early as 10am, right after you've dropped off your luggage at your hotel. Use our Day 1 in Paris Itinerary to get general ideas about what to do during each time slot. Then look for specific activities in the next section. Get familiar with your surroundings and soak up some sunlight (good for fighting jet lag!) by walking around the streets near your hotel. Check out the menus posted outside bistros, brasseries, and restaurants. Find neighborhood parks, pharmacies (marked by a green sign) where you might want to return later to stock up on fancy French soaps and lotions, and small markets or larger stores such as Monoprix, Franprix, and Carrefour. And of course, if you're staying near the Louvre, Notre Dame Cathedral, or another famous attraction, make it your destination and enjoy the close-up views. Optional: At some point before 11am, stop for coffee and perhaps a croissant to raise your energy level. Look for a small cafe near your hotel, or one of the ubiquitous branches of one of the top-notch bakery/cafes dotting the city: Paul, Le Pain Quotidien, Pret a Manger, even Starbucks (where you'll find much better pastries and fresh fruit/yogurt parfaits than in the U.S.). 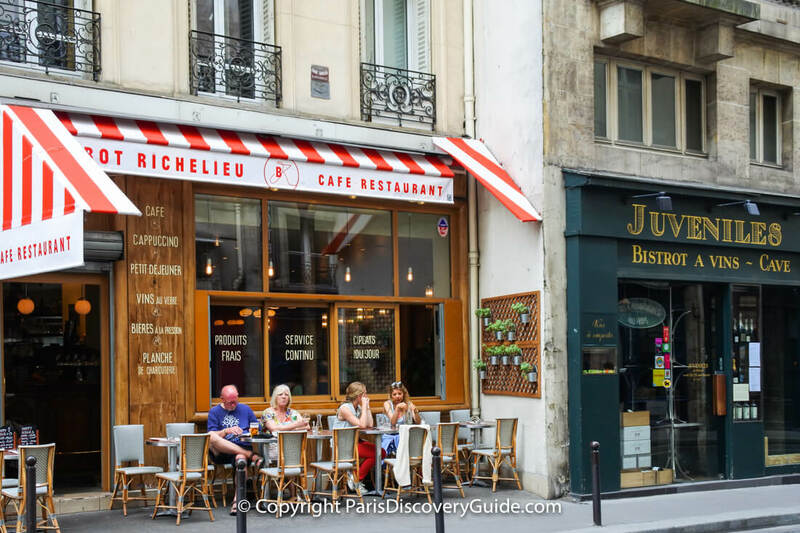 If you are anywhere close to the central part of the city, don't sweat having to order in French on your first morning in Paris - English is widely understood. Although to be polite, try to say bonjour ("boh-jure") for "good morning" and merci ("mare-see") for "thank you" - no matter how badly you mangle the words, your attempt will be appreciated. Alternately, if you crave caffeine as soon as you arrive at your hotel to drop off your bags, ask the concierge or reception desk staff where to find the nearest place to get coffee or tea. If the hotel is still serving breakfast, they are likely to offer you a cup from their own dining room. Head over to a cafe, brasserie, or restaurant you spotted on your walk. If you're not sure where to go, stop by your hotel and ask for a recommendation nearby. Order something light, and avoid alcohol and food such as pasta that might make you sleepy. End with more coffee or tea. Unpack. Take a quick shower. If you desperately need a nap, take one - but force yourself to limit it to an hour. Twenty minutes is better. Your goal is to return to your normal routine as soon as possible. Too much sleep right now will kill your schedule tomorrow. Late Afternoon - 3pm-7pm: Be Active! Boost your energy by being active, preferably outdoors. Do more exploring on your own but this time, target a specific location: stroll along the banks of the Seine River, a famous neighborhood such as the Latin Quarter, or a market street (find details & directions below). 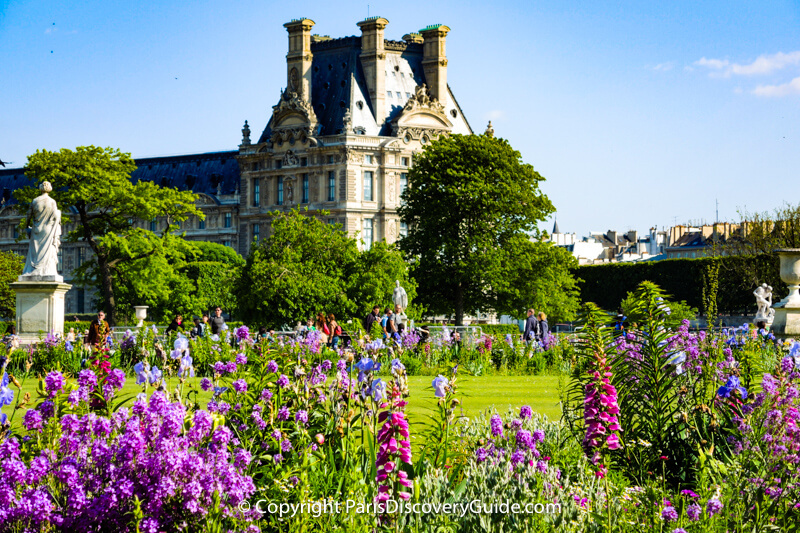 Visit one of the many spectacular Paris gardens and soak up some sun. View Paris from above the rooftops: perhaps the giant ferris wheel parked in Tuileries Garden during summer months, or the Arc de Triomphe's rooftop. Rainy afternoon? Explore a covered arcade, the 19th century Parisian equivalent of a shopping mall, or The Canopy (la Canopée) indoor shopping center at Les Halles. Take a hop-on/hop-off bus tour around the city to orient yourself to the city while glimpsing the Eiffel Tower, Notre Dame, and other famous places, or join a guide-led group walking tour. Now you can begin to wind down and relax over a good dinner and a glass or two of wine. For an easy and relaxing evening, ask your hotel to recommend a nearby restaurant. But for a memorable I'm-really-in-Paris!!! kind of experience, there are lots of other options. Dine in the Eiffel Tower, on a Seine River cruise, at the Moulin Rouge or Le Lido de Paris, or at a jazz club. Return to your hotel, go to bed at a reasonable hour, and sleep well after your memorable first day. Get up early the next morning, refreshed and ready to go out and experience Paris at full speed because there's plenty more to do, explore, and enjoy! Walk along the Seine River (ask your hotel to show you the direction if in doubt) - Pedestrian paths, once highways filled with cars, run along both sides of the river and transform into "beaches" during summer months. Known as Parc Rives de Seine, this wonderful riverbank promenade stretches between Place de la Bastille in the east to the Eiffel Tower in the west and in addition to pedestrian walkways, you'll find lots of sports facilities such as pétanque courts, kids' play areas, lounge chairs and other comfortable seating, and places to eat and drink. 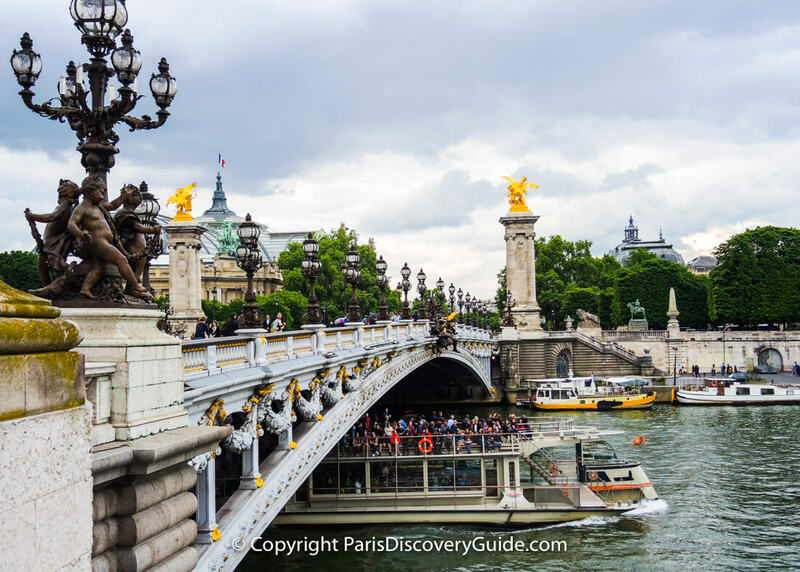 If you're staying on the Right Bank, walk west along the Seine until you reach Pont Alexandre III (the Alexander Bridge) - it's easy to recognize due to its golden winged horse statues, ornate Art Nouveau lamps, and large numbers of cherubs, nymphs, and garlands. To your right, you'll see two enormous glass-domed buildings: Grand Palais, site of major exhibitions, and Petit Palais, home to the city's Fine Arts Museum (Musée des Beaux Arts - admission is free, so go in and look around; treat yourself to tea (more caffeine!) and a snack in the onsite cafe overlooking a sculpture-filled courtyard). Walk across the bridge to the Left Bank and enjoy the excellent views of the Eiffel Tower in the distance. At the end of the bridge, turn left and walk back along the Left Bank of the Seine. Continue until you see the towers and spires of Notre Dame Cathedral on Île de la Cité, one of two small adjacent islands. Cross the river and walk around the Cathedral - free admission, so if lines are short, go inside and admire the beautiful rose windows and other stained glass (save climbing up to the Towers, which require a ticket, for another day). After you've had your fill, cross back to the Right Bank and return to your starting point. Walk along a specific street and explore all the shops, markets, churches (step inside and admire the stained glass, art, sculptures, and architecture) and boutiques. 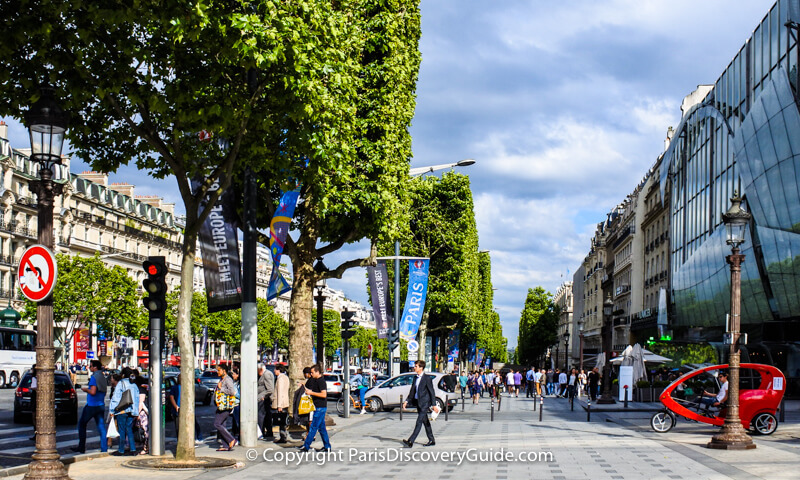 Champs Élysées between the Arc de Triomphe and Place de la Concorde (fashionistas will want to make a window-shopping detour down boutique-lined Avenue Montaigne at the Franklin D Roosevelt metro station). In addition to all the fashion emporiums, car showrooms, and cool restaurants, you'll see a number of passages to interior shopping complexes, especially on the north side of the street - go in and explore! And of course at the ends of the your walk, you can get close-up views of the huge Arc de Triomphe and the Egyptian Obelisk. Rue Payenne in the Marais (3rd arrondissement) - Only a block long but home to four beautiful small gardens and parks, plus the Swedish Cultural Center's famous cafe where you can stop for a cup of Swedish coffee and a fresh-baked pastry. More about the gardens and other attractions along Rue Payenne. Rue des Martyrs in SoPi (South of Pigalle neighborhood; closest metro: Notre Dame de Lorrette - find the lower end of Rue des Martyrs behind Notre Dame de Lorette Church, which you can see from the metro station) in the 9th arrondissement to Montmartre in the 18th (metro: Abbesses) - A foodie's fantasy, lined with small shops selling gorgeous produce, French cheeses, sausages and charcuterie, organic jams, olive oil and honey, wine from every region of the country, mouth-watering breads and pastries, plus a seemingly endless of places to indulge in brunch, chocolate, dim sum, and romantic late-night dinners. Explore a (mostly) pedestrian-only market street (pick one near your hotel). Ready for lunch? 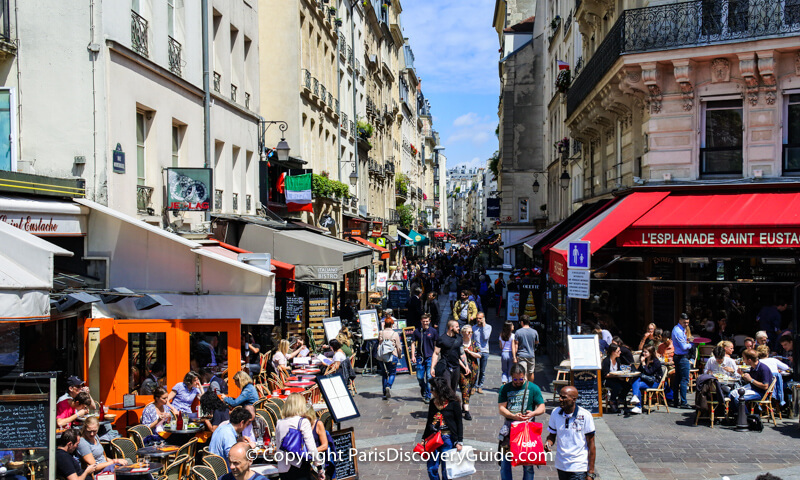 All of these streets offer plenty of tempting sidewalk cafes - so take your pick! Rue des Rosiers and Rue Vieille du Temple in the Marais (metro: Hotel de Ville). 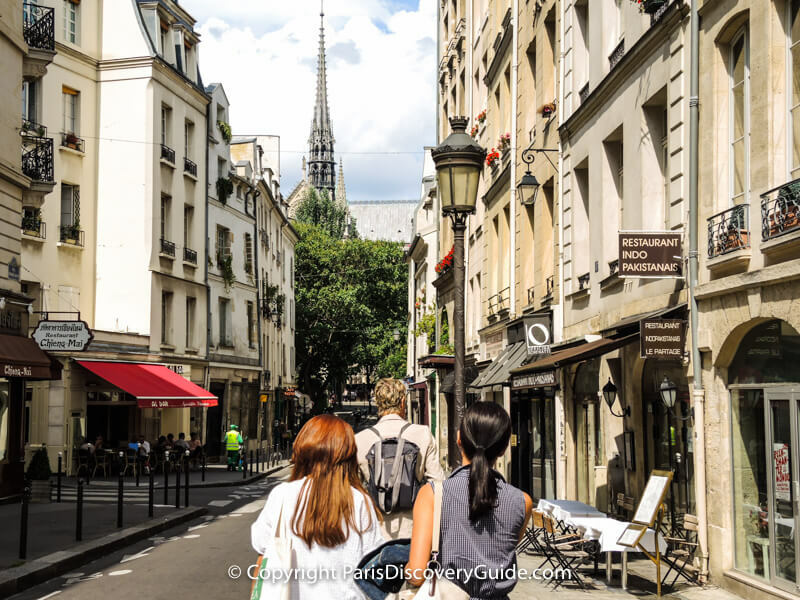 Paris travel tip: Pedestrian-only streets in Paris used to be limited, but now car-free days take place on the first Sunday each month in the 1st, 2nd, 3rd, and 4th arrondissements plus on additional Sundays and other days in other neighborhoods throughout the city. The Latin Quarter (5th arr), the Marais (3rd and 4th arr), Montmartre (18th arr), Saint Germain des Près (6th arr), Île de la Cité (1st and 4th arr), and Île Saint Louis offer wonderful architecture, historic sites and monuments, lovely parks and squares, old churches, small winding streets, almost-hidden spaces, and plenty of places to stop for coffee or a meal plus fascinating people-watching. Choose a neighborhood close to your hotel, and spend a couple of hours wandering around and soaking up all the sights. Jardin des Tuileries (Tuileries Garden, on the Right Bank) - Dating back to the 17th century, Jardin des Tuileries is west of the Louvre, next to the Seine River. Groves of trees, gorgeous gardens, two large reflecting pools lined with chairs, grassy lawns, a children's carousel and playground, and a huge carousel are just the beginning of what you'll find here. For two months during the summer, a carnival complete with rides, games, and pink cotton candy entertains kids of all ages in an area next to Rue de Rivoli. From mid-November through early January, a Christmas market offering hot mulled wine, gifts, and regional food specialties gets everyone into the holiday spirit. At the southwest corner of the garden, l'Orangerie Museum displays Monet's famous waterlily paintings (and many other wonderful pieces of art). To the east is the Louvre. You won't run out of wonderful things to see and do here. Jardin du Luxembourg (Luxembourg Garden, on the Left Bank) - Filled with beautiful statues (can you spot the small Statue of Liberty?) and fountains, lush flowers and trees, and a large octagonal lake where children race toy sailboats, Jardin du Luxembourg offers something for everyone: jogging paths, pony rides, a small outdoor cafe, a merry-go-round, and a marionette theater for kids, and plenty of comfortable seating. Located in the 6th arrondissement, Luxembourg Garden also borders the 5th - so you'll find plenty of interesting small shops, beautiful old churches, and naturally since you are in Paris, many appealing places to eat. Walk all the way around the rooftop terrace of the Arc de Triomphe and you can see most of the city's most famous attractions - the Eiffel Tower, Sacre Coeur, Notre Dame, the Seine River - as well as the layout of the city's streets. There are 284 steps to the top, but there is an elevator if you need it; however, it doesn't go all the way to the top, so if climbing the remaining 40 or so steps isn't for you, just enjoy this massive monument from the ground. Lines can get long and be slow (the total number of people at the top is restricted), so a skip-the-line ticket will benefit you. The Eiffel Tower gives you spectacular views from its second and third levels, but crowds can be intense - perhaps too much so for your first afternoon in Paris. If you want to go anyway, be sure to book tickets or a guided tour online before you leave home. A calmer option is the observation floor/open air roof terrace atop Montparnasse Tower, the tallest building in the city. Get your tickets in advance to avoid waiting in line, take the private elevator straight to the 56th floor, and stop by the bar for a glass of Champagne to toast your first day in Paris. Enjoy the 360 degree views of Paris - including the Eiffel Tower. The seasonal ferris wheel in Tuileries Garden near Rue de Rivoli lifts you up high above the ground and gives you wonderful views of rooftops and chimney pots, the Eiffel Tower and Sacre Coeur, and the entire area around the Louvre and Place de la Concorde. Buy your tickets on the spot - the line is never very long, and moves quickly. Sacré Coeur sits on the highest hill in the hilly-est neighborhood in Paris. Although views from the dome and even the top of the steps are amazing, those from the viewing platform in front of Sacre Coeur are almost as good and if you're feeling tired from your flight, the platform lets you avoid the final climb. The easiest way to get up to Sacré Coeur, although not the shortest in distance, is to take the Metro to the Abbesses station. Walk 3 blocks east - first along Rue de Yvonne le Tac (2 blocks), which morphs into Rue Tardieu (1 block). At that point, you should see the entrance to the Funicular, a sort of hillside elevator that will take you to the top for the cost of another Metro ticket. Once you reach the top and get out, you'll see the viewing platform at the base of the final hill on which Sacre Coeur sites. Alternately, you could also walk up the stairs going up the hillside - they're really not bad, so take your pick. In addition, there's a "Montmartrobus" which winds its way up the hill, also for the cost of a metro ticket. Figuring out where it stops can be a little tricky and if you're jet lagged, maybe not the best choice. 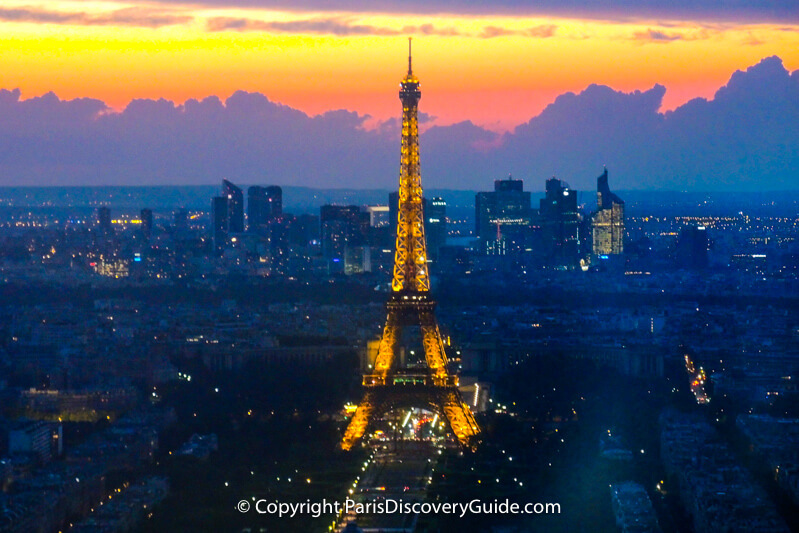 Dinner at the Eiffel Tower on your first night in Paris is sure to be memorable! You'll enjoy a gourmet 3-course dinner and wine at the chic 58 Tour Eiffel restaurant on the Tower's first level, and romantic views of the whole city spread out before you in an panorama you'll always remember. Add to that the sparkling light show put on by the Tower itself, and you'll feel like you're surrounded by stars - and, in fact, you are. After dinner, stroll across the river to the viewing platform at Trocadero for spectacular Eiffel Tower views. Lots of different options are offered - pick the one that you like best! What should you NOT do? Let's assume you've just arrived after a transatlantic flight and you're somewhat tired and jet lagged. Your energy level may not be as high (or predictable) as normal, your coordination skills may be a little lacking, and you may feel sleepy at unexpected times of the day. Climbing to the top of Notre Dame's towers (387 steps) or to the 2nd floor of the Eiffel Tower (669 steps). For context, the average number of steps between floors in an American house is 16. Segway tours - loads of fun, but wait until you're fully awake and your coordination skills are at their best. Ditto for bike tours. Long bus tours that might lull you to sleep. Hop on/hop off buses are fine. Just get off and walk around if you feel drowsy. Cooking classes - A wonderful Paris activity, but wait until you're fully awake and less likely to accidentally chop off a finger. Any place that's dark and sleep-inducing - Exploring the inside of churches, Catacombs tours, and Paris sewer tours fall into this category.